RALEIGH, NC — IMA Schelling Group USA, a single-source provider of sales and after-sales support of IMA and Schelling products, will hold live equipment demonstrations in the company’s recently completed 10,000-square-foot showroom in Raleigh, NC. Demonstrations will include the Barbaric RTS 02 return material-handling system in conjunction with the IMA Novimat Compact R3 edgebander. 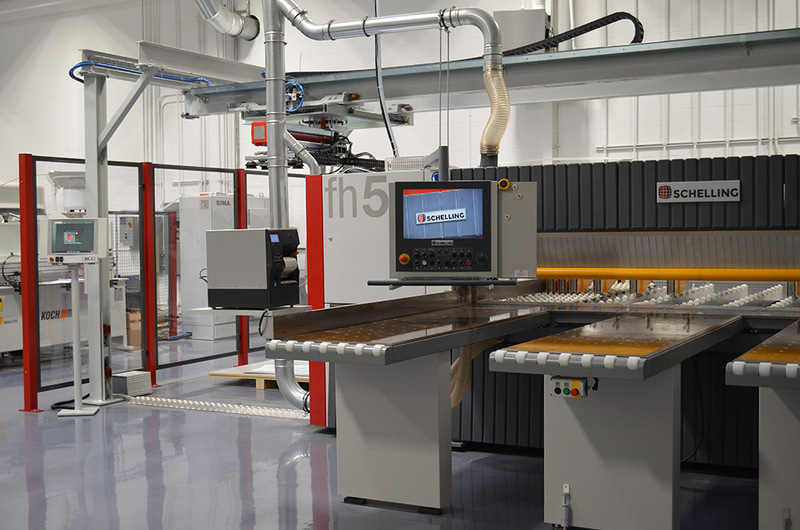 Also demonstrated will be the Barbaric LCV linear feeder, which works in conjunction with the Schelling fh5 automated panel saw. “The Barbaric material-handling machines carried by IMA Schelling are ergonomic, durable, automatic space-saving systems that deliver high profitability and short payback times with special attention to speed, design and durability,” explained Peter Tuenker, Managing Director, IMA Schelling. “These automated material-handling machines utilize a vacuum-suction technology that gently manipulates materials to help prevent material damage and provide greater flexibility in part sizes.” While at the showroom, visitors can also receive hands-on training with the machines and speak directly with the IMA Schelling staff. IMA Schelling and Austrian-made Barbaric automated material-handling systems debuted their North American alliance at last year’s AWFS show. The full range of Barbaric material-handling systems including return conveyors, linear feeders or automated storage retrieval systems are offered by the IMA chelling Group in North America. The group also handles the after-sales support for the product line with factory trained technicians and a local spare parts inventory in their offices in Raleigh, NC and Mississauga, Ont. IMA Schelling Group USA is a single-source provider of sales, service and support of IMA and Schelling products. The IMA Schelling Group USA is designed to give the two companies’ customers and business partners the benefit of working with one source for customized industrial engineering manufacturing and standard machinery sales under one roof in Raleigh, NC. The IMA Schelling Group works collaboratively with businesses ranging from mid-sized woodworking, metalworking and plastics shops to major corporations to engineer customized, industrial manufacturing system solutions that optimize throughput in the North American woodworking, metalworking, plastics and composites markets. To schedule a demo, contact IMA Schelling Group USA through its website https://imaschelling.us/ or call 919-544-0430.